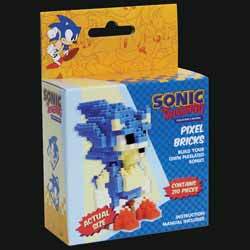 Paladone's Sonic the Hedgehog: Pixel Bricks allow you to create your own mini (7.6cm tall) pixellated looking Sonic. Each kit comes with detailed instructions - and believe me you're going to need them as unless you're a total wizard when it comes to puzzle construction, this is quite a challenging figure to put together. But believe me, it's well worth it. The piece are incredibly tiny and it's advisable that you clear the table and carefully layout all the piece in front of you. If you get frustrated, then put it down for a few minutes and come back to it later. This isn't a baby toy, it's a tricky puzzle that will test your patience. For some of us, Sonic the Hedgehog's appearance on the Sega Mega Drive cost us our childhood. While other kids were out chasing a hoop with a stick or (heaven forfend) kissing girls, some of us where ensuring we'd get early arthritis in our thumbs as we attempted to collect as many golden rings and Chaos Emeralds as possible in order to tackle Dr Robotnik. Like the game, this kit is challenging, and could see you spending several hours to complete - mainly because it's incredibly fiddly and if you press to hard you'll find bits collapsing. But, for me, this was part of the challenge. There's no point having something like this if you can put it together in five minutes (which, I'm assuming most younger children will be able to do). Maybe the very early onset arthritis in my thumbs (did I mention that already?) was a hinder... but I doubt it (as I made the whole thing up as a sort of poorly thought out joke). 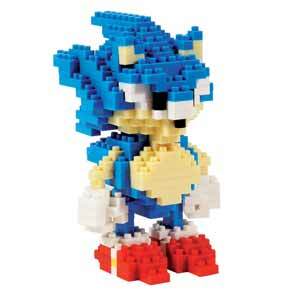 It's an ideal gift for anyone who grew up on Sonic, or even for yourself. My completed Sonic now takes pride of place on my desk... Now I'm off to buy the other model in the series: Tails!